Three new polls of likely New Hampshire voters released Thursday show that Republican presidential nominee Donald Trump is gaining serious ground on Democratic nominee Hillary Clinton. A WBUR survey, shows Trump leading Clinton 40 to 39 percent. Gary Johnson is at 10 percent and Jill Stein at 3 percent. A poll conducted three weeks ago by WBUR had Clinton leading Trump 41 to 38 percent. A Suffolk University/Boston Globe poll shows Trump and Clinton even at 42 percent apiece. That's a slight shift from October, when Clinton led by 2 percent. Johnson received 5 percent and Stein 2 percent. In a UMass Lowell/7News poll, the nominees are even at 44 percent among likely voters. That poll also has Johnson at 5 percent and Stein at 2. 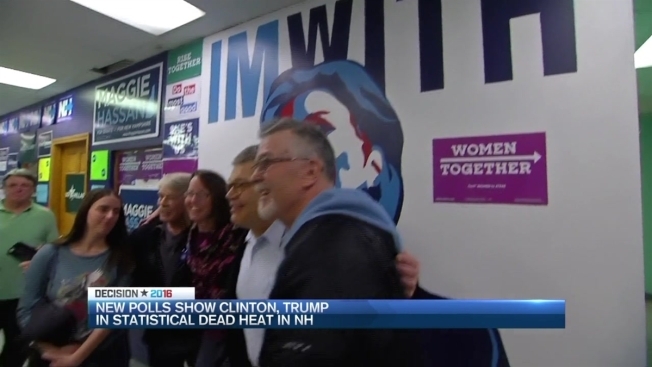 Trump and Clinton both remain wildly unpopular in the Granite State. The WBUR poll had Clinton's unfavorability at 59 percent, and Trump's at 57 percent. Their respective running mates have unfavorability ratings in the 34 to 37 percent range.